There are several reasons I’m not big on personal trainers: First, they’re expensive. For example, trainers at my gym start at $60/hour—and that’s on top of my membership fee. Second, they’re inconvenient. I’m a night owl by nature, and nobody is offering personal trainer services at 2 a.m. on a Tuesday morning. (At least not that I've been able to find). Lastly, as a self-motivated gym rat who’s been lifting for years, I’m somewhat skeptical about whether personal training is really worth it. Naturally, this all means that I jumped at the chance to review Wello, a personal training web service that offers affordable one-on-one sessions in the privacy of your home (or hotel room, or conference room, or wherever). The twist here is that Wello’s services are all offered online—via a two-way live video feed. Getting started is pretty simple. The website is easy to navigate, with large icons and short, to-the-point explanations. There are two workout options: One-on-one training or group sessions. A one-on-one workout is a traditional personal training session, with just you and the trainer on your respective webcams; while a group workout is like a small private class. One-on-one sessions cost between $35 - $199 an hour, while group workouts run between $10 - $50 an hour. To start using Wello, you'll first need to find a trainer. 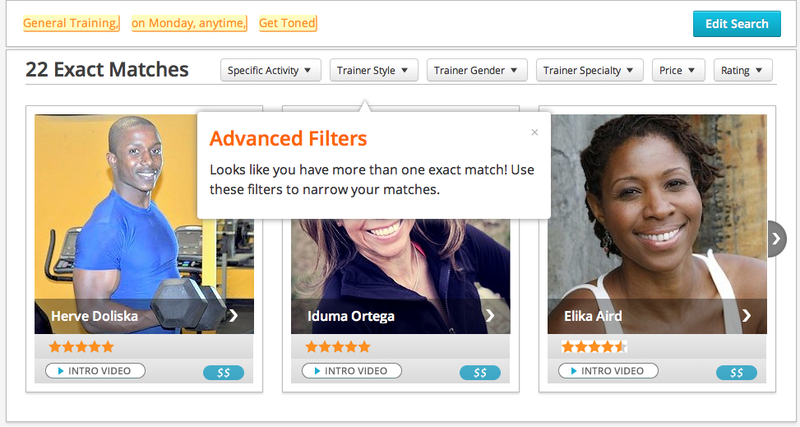 Wello’s trainer search is as simple or as comprehensive as you want to make it. You must fill in at least two of three blank fields: What type of workout you want to do (yoga, general training, Pilates, sports, martial arts, therapy, or aerobics), when you want to work out, and what your goal is (“get toned,” “lose weight,” etc). Once you’ve filled in two (or all) of these fields, you can further narrow down your search by specific activity, trainer style, trainer gender, trainer specialty, price, and rating. Trainers come in four different tiers: Tier 1, Tier 2, Tier 3, and “Celebrity.” Tiers 1 – 3 vary in pricing based on trainer experience, while Celebrity trainers are trainers to the stars. The first three tiers are more reasonably priced ($35 - $59 an hour), while Celebrity trainers cost $199 an hour. I see no need for celeb trainers myself, but if you’ve ever wanted to workout with the yoga instructor who trained Harvey Keitel and Jessica Seinfeld, now’s your chance. Tell Wello what you want to do. I told Wello I wanted to do a "general training” workout “on Monday at 2 a.m.,” and that my goal was “not sure.” I ended up with Willie Moore, a personal trainer with 5-6 years of experience (and a pretty inspiring story). After I chose my trainer, Wello prompted me to create an account to schedule the appointment and pay for the session. Once the account was created and the session was scheduled, I was bombarded with emails from Wello. The first email offered my account details (creating an account is so quick they don’t ask for a password but simply send one to your email), the second email provided my workout details, and the third was from my trainer. Wello offers a messaging service that lets you communicate with your trainer before the workout, so you can sort out various issues such as injuries, small spaces, and equipment. Wello also sent me a reminder email about three hours before my workout was about to start. Wello uses its own platform for the live video stream. The platform requires a one-time plugin download for both Windows and Mac OSX—I used my 11-inch MacBook Air and the plugin install took less than a minute. The only real equipment you'll need is a computer with a webcam and a microphone/speaker setup, though if you want to use extra workout equipment you certainly can. Overall, the workout experience was excellent. The Wello platform worked very well—there may have been some hitching and the webcam quality wasn’t perfect, but it was good enough for what we were doing. My trainer showed up right on time, we talked for a few seconds about what was going to happen, and then we jumped right in with warm-ups. I did my workout in my home office, which only has about five square feet of open floor space, but my trainer was able to create an effective workout around the space. Details on a Wello class. My workout was fairly simple: A combination of squats, squat jumps, mountain climbers, leg lifts, planks, and push-ups—and it definitely got me sweating. My trainer was very vocal, and he showed me each exercise before we started. The only minor issue with the webcam training is that a trainer can’t touch you to correct your form—while this isn’t really a problem with basic exercises, it might be an issue with advanced yoga or weight lifting. Once the workout was finished, Wello sent me yet another email (to congratulate me on completing the workout, and to solicit feedback). I didn’t have a chance to try out the group workouts (I tried, but they kept getting canceled for lacking the minimum number of participants). Group workouts are similar to one-on-one workouts: Each participant has a webcam, as does the trainer. All participants can see all the other participants (this seems like it’d be great for a group of friends), as well as the trainer. 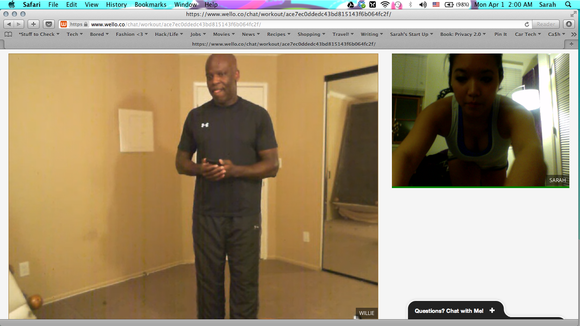 Because there are so many people on webcam at once, group workouts are limited to between three and five participants. A live Wello training session. Overall, Wello is a pretty neat service, and it’s found a niche. I especially liked the fact that trainers are available at all times (nice for night owls and/or for travelers), and that they’re able to work with the space you have available. I definitely felt like I’d be able to use this service in a hotel room while on vacation, which is a big plus. It’s also relatively affordable, and you save money (and time) by not having to leave your house (or office, or wherever you choose to work out). Personal training still isn’t really my thing, but this service definitely makes the entire idea more palatable. Having someone there to motivate you works wonders, even if they’re just on a computer screen. If you want to stay in shape while traveling, or keep odd hours, Wello can help. With a straightforward, easy-to-navigate website and authorized trainers, Wello is a great service—however, video streaming quality may vary and your trainer can only correct your form audibly.